Bloodroot (aka. 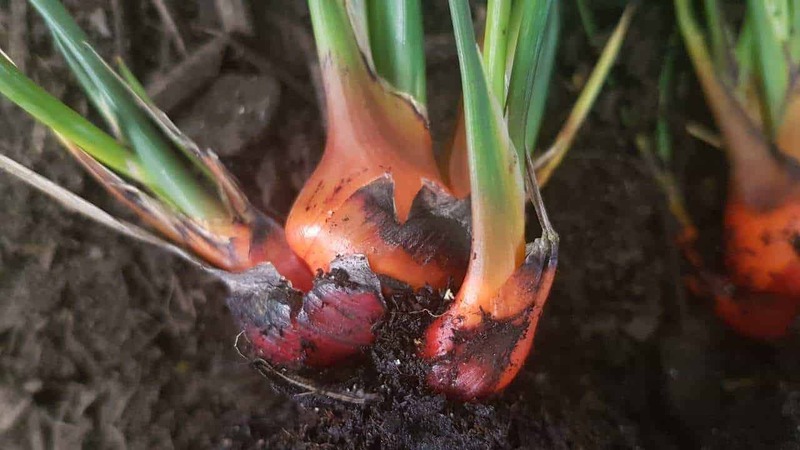 Bohn, Meen, Mardja or Menang) is a native bulb vegetable, long used by the Noongar Aboriginal tribes of Western Australia both as a food source and to help with dysentery, mouth sores and toothache. It packs a spicy punch, akin to radish and chilli, and oozes a reddish sap when cut. A relative of the Kangaroo Paw, it can be found growing individually or in small clusters along the south and west coast of Western Australia. The edible roots when eaten raw are very spicy and can numb the lips. Best baked or roasted, and may be pounded and dried and used as a spice. The compounds that colour this vegetable are unique to the Bloodroot, and were traditionally used as a red dye. Currently, they are being studied for their antibacterial and antitumour properties. Bloodroot bulbs are ready for harvesting during August and September (the Nyoongar season of Djilba). Simply dig them up and separate from the above-ground leaf parts of the plant. As a WA native, this water-wise, drought-tolerant plant can thrive in poor, sandy soils as well as sandy clay soils. Bloodroot is Summer dormant (Birak & Bunuru) and slow growing. It may take a couple of seasons to produce a decent bulb. Prefers full sun, but may be grown in dappled shade. Typically grows between 0.3 – 2m in height, producing clumps of tough green strappy leaves that turn black as they get older. From October to January (Kambarang), they produce a distinct spike with dark purple-black flowers growing at the tip. This species is not normally chosen for ornamental value, but planted in groups, it may serve as a curious feature of an eclectic native landscape. Can I grow Bloodroot in pots? Yes. Choose a medium to large pot with drainage holes, and use a free-draining sandy potting mix with good aeration. I don’t have a lot of space. Can I plant my Bloodroots close together? Like when growing carrots, you do not need much space between your Bloodroot plants. Whether you plant them in the ground or a pot, do ensure you use a light, well-drained, sandy soil to prevent waterlogging. How often should I fertilise my Bloodroot? Bloodroot does not require any fertiliser, though for best results, you may wish to replenish the growing site with a little organic compost and slow-release fertiliser after a harvest.